In using the House Oversight and Government Reform Committee he chairs to criticize a lack of "transparency" in political activity by unions but ignoring similar issues relating to corporate political activity, Rep. Darrell Issa (R-CA) demonstrates that he is concerned less with "freedom of choice in our democracy" than with undermining organized labor's ability to combat the political influence of big business. Every worker should have the choice to decide whether their money is taken from their paychecks and used to fund political activity. When this occurs, a worker should also have the right to know how their money is spent. Because of recent court decisions and a systematic effort by the Obama Administration to reduce union transparency and reporting requirements, union workers do not currently know how much of the money from their paycheck dues is being funneled to SuperPACs or used for other political activity. Issa expresses no such concern about corporate political activity. When a corporation spends money on political activity, that's money that it has because of the work of its employees, and money that could otherwise go to employee salaries. 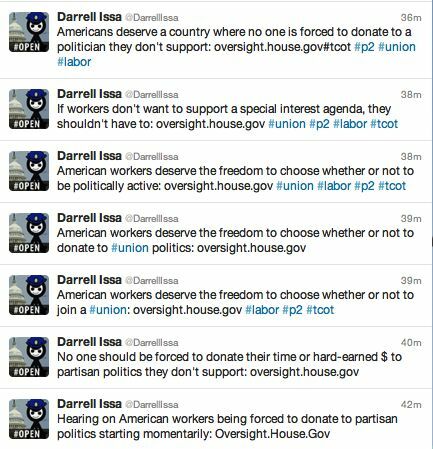 But Darrell Issa doesn't think employees have a right to choose whether or not the fruits of their labor are used to support politicians they don't like. Some AT&T shareholders want more than just dollars and cents from the board of directors in the aftermath of the company's aborted takeover of T-Mobile: They want to know how company money is being spent to influence politics. A slew of corporate boards - including those of Apple, Ford and Pepsi - are being petitioned this proxy season by stockholders demanding an accounting of corporate funds being spent on campaigns, super PACs and political causes as corporate governance experts and members of Congress press for new federal rules. "Companies like AT&T are not tracing where shareholder money goes, and there needs to be due diligence on every political contribution, because it could have a wide-ranging effect that could impact the reputation of the company," said Adam Kanzer, managing director and general counsel for Domini Social Investments, an AT&T shareholder group trying to get the company to disclose more of its political spending. The investor movement for more transparency of corporate funds used for politicking was energized by the U.S. Supreme Court's 2010 decision in Citizens United v. Federal Election Commission, which opened the door for unlimited political spending by corporations and new avenues to mask the source of money. By ignoring the lack of transparency about corporate political spending, Issa shows that his real priority isn't the freedom of union members — it's further rigging the system in favor of giant corporations and against employees.